Two trams in Manchester have recently appeared in service wearing new vinyl wrap adverts with both making their first public appearances in quick succession at the start of November. The two M5000s to carry the adverts are 3004 and 3018 with the sponsors being LBC and Call of Duty. First to appear was 3004 which is being sponsored by LBC – now a national radio station via digital platforms. This tram has a fairly pleasing colour scheme of shaded blue with some signwriting and as always in Manchester contains full window contravision with the ends free of adverts and still in the standard fleet livery. Coming up quickly on the heels of 3004 was 3018 which features an advert for the latest edition of the popular Call of Duty computer game. 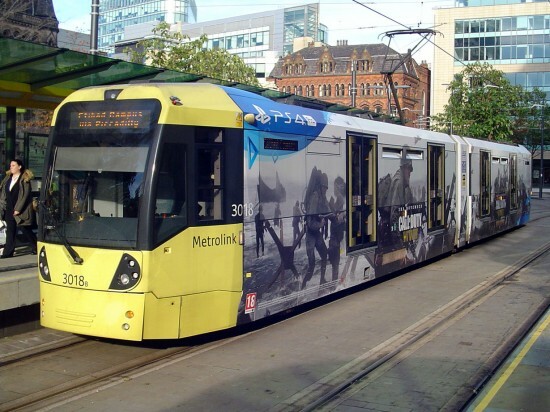 With images of the game theme – World War II – covering the body sides the tram is not nearly as colourful as that on 3004 and once again contravision is used extensively with the body ends devoid of all adverts.